Your research focuses heavily on climate change and how it is reflected in air pollution and ice core samples. Can you talk a little about how you got interested in these topics in the first place? EO: I’ve been interested in climate change for a really long time. My sixth grade year-long research project was about greenhouse effects and climate change. I grew up in a time when the global community was just starting to understand the impact that humans have on temperature. I love weather, I love storms. I think my friends, growing up, assumed that I would become a weatherman someday because I just love the weather. I also really enjoyed earth sciences, and so all those things came together. While I was doing my master’s degree in New Zealand, I discovered glaciers and mountaineering. And so those things came together too, and I just found myself drawn to the ice cores because they are such a powerful way to look at climate in the past. Two February articles on your research on the Alaskan ice core samples and climate change mentioned that you and your team have been conducting field research on Mt. Hunter since 2008. What did you and your team do as part of this field research? EO: We’ve been very interested in how climate has changed around the North Pacific region because there has been a lot less attention paid to that, and it is a very important place that affects climate change in the United States and elsewhere. We wanted to find a place in Central Alaska where we could collect a good ice core. Starting in 2008, we began conducting expeditions every year. We were using a radar system to figure out how deep the ice was in different places to identify good ice core sites. And we found a great site in 2013. We had a really ambitious expedition to collect two ice cores at the top of this mountain. Collecting two ice core samples from the same spot had never been done before, as far as we know. What we found is that temperatures are warming in the mountains faster than they are warming at sea level. We’ve seen two and a half to three and a half degrees Celsius of warming over the last century, and we see a 60-fold increase in melts on this glacier — 60 times higher today than it was a hundred years ago. And we’ve seen this doubling of snowfall up on that mountain, which may sound strange to people. After all, when you think of climate change, you might think of less snow. But what we often see with climate change is more rainfall, and here on the top of the mountain, it just doesn’t ever rain. So, for example, here in New England, we’ve seen more and more rainfall with climate change, and it’s the same kind of story up there. It’s just that it’s so high up in the mountain that it all falls as snow. Why are ice core samples a good indicator of climate change? EO: There are lots of reasons why ice cores are very useful for understanding climate change. One is that with ice cores, we can often see climate change in individual seasons going back through time. Sometimes we can get 10 or even 20 samples in a single year, going back thousands of years. So oftentimes when we look in the past with geological records, we can only see one sample every decade or one sample every century. With ice cores we have a much finer view of what’s happening. Another reason is that we can see so many different things happening in the climate system all in one record. We can see how storms are changing, how temperatures are changing and how pollution is changing. We can actually record the amount of greenhouse gases, which are what are causing all the changes. And lastly, ice cores are usually recovered from the polar regions, Greenland and Alaska, and these are the areas that are experiencing the most rapid climate change. These are also the areas that are the most sensitive to the climate change, so it’s very scientifically useful to get records from these sites. You also mentioned in the articles that people should start doing something about climate change. What actions do you think should be taken to address climate change? EO: Probably the most important thing that everyone can do is vote, and vote for people who make climate change a priority. We need to start addressing this on a national and international level. We can all do individual things in our own lifetimes by thinking about our energy use, particularly when we make big decisions like buying a car or buying a house. But what we really need is larger action on a national level, and that’s not going to happen as long as the folks in Washington don’t think it’s a priority for us. We’re starting to see that happening now, I think. It was really interesting how little climate change was talked about for the last decade, since the economic downturn in 2008 and 2009. And now, all of a sudden, in this election cycle, we’re hearing a lot more about climate change, particularly among Democratic candidates. I’m optimistic that it’s becoming a larger part of the national conversation, and that needs to happen for us to coordinate on a national level. But I think for students at Dartmouth, it’s thinking about their own energy footprint: thinking about when they fly, when they drive, when they buy a car, when they’re leaving Dartmouth and making these big life decisions. Thinking about their energy impact and making sure that they get out to vote. What classes have you taught at Dartmouth so far? EO: I’ve taught a lot of different classes. I’ve been here since 2007, and I’ve been really fortunate to teach classes from oceanography, marine geology, up through advanced climate dynamics. Classes I teach every year are typically EARS 2, “Evolution of Earth and Life,” which is a really fun class to teach because we are often teaching to non-majors. It’s a large class and often one of the one or two science classes that many students would take in their Dartmouth careers. In the course, we teach the entire history of the Earth, and I think it’s important for students to have a sense of how we got to where we are today. Not just as a species, but as an entire planet. And that feeds into the larger discussion of climate change. We look at the past and see how climate changed naturally, what that did to animals and life on this planet and what caused those things. What we keep seeing over and over is that CO2 is really important, and relatively small changes in the climate can have massive impacts on the life on this planet. And then EARS 14, “Meteorology,” is another class that I teach quite a bit, as I sort of mentioned that it is my original true passion. What part do you enjoy about teaching at Dartmouth in general? EO: The students are incredible. They are super engaged, they are incredibly bright and talented. They want to learn. It’s a real joy to interact with students like that on a daily basis, both in the classroom and in my lab with students who choose to do research with me. What are some of the current research projects that you are working on? EO: We are continuing to focus on the polar regions with the ice core work. We have two different ice cores from the South Pole, and we’ve just finished analyzing them in the lab. We’re working on trying to understand how the climate has changed over the last several thousand years. I’m also focusing quite a bit on climate change happening right now. We are focused on melting in Greenland and how fast that has been happening over the last few decades. We are trying to understand how much of what we see up there is from human causes and how much is from natural cycles. What we’re seeing is that human CO2 is playing a larger and larger role in the amount of melting that we see there. And I focus a lot on the climate here in New England. We’re looking at how extreme storms here are changing in New England — like hurricanes and really extreme thunderstorms that cause flooding and widespread damage to the community. We want to learn more about how those are changing with climate change and how they’re related to changes in the jet stream — things like the polar vortex that people have heard about. And climate change here even has connections to Lyme disease. My wife is a pediatrician, and in our time here these last 10 years, we’ve seen an explosion in Lyme disease in the Upper Valley and more broadly in New Hampshire and Vermont. We’re also looking into the future using climate models and trying to figure out what the climate here in New England and in Antarctica is going to look like in the future as sea levels rise due to glacial melting in Alaska and Greenland. What do you enjoy about doing research at Dartmouth in general? EO: I think what makes Dartmouth unique is that we really do emphasize both teaching and doing research. We are a undergraduate teaching university that focuses a lot on our undergraduate students in what we are doing in the classroom and the laboratory. We do all of this while also being an R-1 research institution doing really cutting-edge research with support from the institution to do that kind of research. I think I would really miss that balance between teaching and research at another school. I went to Middlebury College, and I love Middlebury. I had a wonderful experience with my classes there. 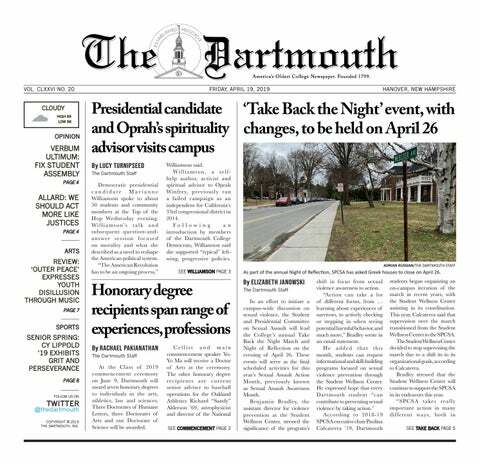 But I think that we’re able to offer more diverse and impactful experiences here at Dartmouth. And, if I were solely focused on research — like professors at many R-1 institutions are — I know I would really miss being in a classroom and teaching the students. So I love how both parts of my career are so important and valued here at Dartmouth.